Our regular tours, out back and beyond. Specifically designed to meet your interest; for individuals and groups. 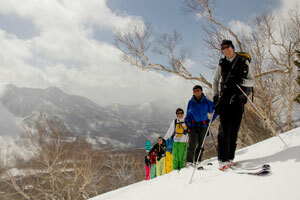 We tour regularly to peaks accessible from all the major ski areas in Myoko. We'll take the area lift as high as we can, then hike up to the summit—at 1,935 to 2,100 meters. This means a climb of about 1.5 to 2.5 hours, depending on the group and the destination. Some courses are easier than others; if you think you're ready to try moving off the groomed courses, we have a plan for you (let's talk!). And if you're experienced and want something longer, steeper and (hopefully) deeper, we have that, too. Take a closer look at the courses here. You can also see the courses we're thinking about each week here. We feature small groups and a high ratio of guides to guests. 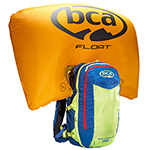 Normally one guide will be with up to five people maximum, and we often add a second guide with five. And we don't get much larger than that. You will need some basic equipment (rentals are available) and proper clothing—see this list for more information. Come to our center just below the Myokokogen Sky Cable Gondola at Akakura Kanko Resort. We do have parking available in front of the center. There we'll go over the day's tour, weather and snow, talk a bit about safety, make sure everyone has everything they need, and answer any questions you have. We'll hand out lunches at this time as well. We'll go by van to the departure point, usually one of local lifts. For some tours we may need to depart early; we'll let you know ahead of time in this case. We are always ready to create special tours for an individual or group, to meet your specific needs and interests. Just let us know what you'd like to do, and special requests for terrain, activities, or even food, and we'll be very happy to develop a package for you. One-day tours ¥18,000 per person. Includes everything: guide fee, insurance, lift tickets, lunch*, and transportation (not including sales tax). Rentals extra. 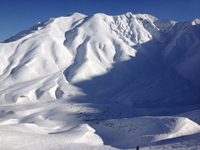 Powder experience tour ¥15,000 per person. Minimum of two people (normally; please ask!). Includes round-trip transportation, guide/instruction fee, insurance, lift tickets, lunch on the hill (not including sales tax). Introduction to friendly locals no extra charge. *One-day tour lunches are simple (but filling) Japanese-style bentos; vegetarian and other versions are available. Ski equipment (skis, board, boots, poles; some rentals available); skins/snowshoes (for skiers, please use skins for your own skis, and ones which you have tested prior to taking part in the tour); a waterproof/breathable jacket and pants; full layered wear: under and middle layers of wool or synthetic material (for all your wear, NO COTTON please! ), gloves (with spare pair highly suggested), hat(s), goggles, sunglass; lunch (normally we will provide); plenty of water or other drinks; emergency food; shovel, avalanche beacon and probe (we'll make sure you have these). Helmet, thermos with warm drink/water; compass; 1/25,000 scale map (we have the two main topographic maps, with English key, available at just ¥1,000 for one, ¥1,500 the pair—you'll learn a lot). Rental is available for some items. When in doubt, just ask! Our home course, accessed from the top of the Akakura Kanko Ski Area. A 400-meter hike up (and it's pretty steep on the main slope! ), lunch at the top, then more than 1,000 meters down through spectacular beech forest. The longest course in the area; a descent of more than 10km, through fantastically varied terrain including open slopes, beech, birch and pine forests, and a winding mountain road. A great tree run, above Ikenotaira Ski Area. We usually approach from the Suginohara Ski Area on a beautiful hike through the woods, or from Ikenotaira for newer climbers. This is also a safe alternative when snow conditions elsewhere are questionable. Depending on the snow, we may ski all the way back to Dancing Snow. A totally natural tour—no lifts and no crowds. Challenging for the approach, the hard work is rewarded by a big view, open slopes at the top and great tree runs all the way down. Another solid climb on this course; 900 meters from the top of Kurohime Ski Area. The slopes can be moderately steep, but often with some of the finest powder that falls in the area. Tours to Sadoyama continue to the secondary peak within Kurohime.